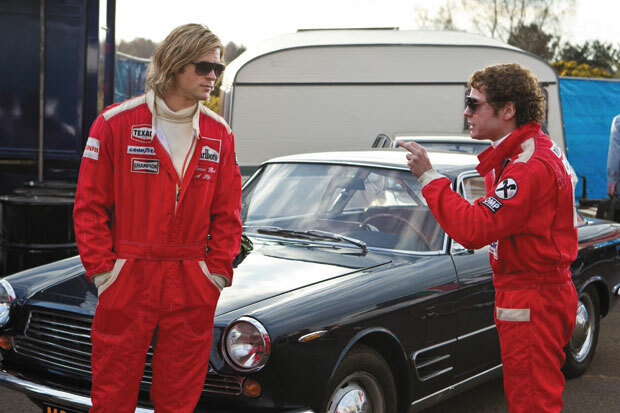 Perhaps best known for his role as a German war hero in Quentin Tarantino’s Inglourious Basterds, Daniel Bruhl is about to become famous for his portrayal of Austrian driver, Niki Lauda, in Ron Howard’s ‘70s-set racing drama, Rush. Growing up in Germany, it’s impossible not to know who Niki Lauda is: the story of the determined racer who overcame horrific burns suffered in a crash during the 1976 Formula 1 season to get behind the wheel again a mere six weeks later has attained the status of a national myth. Still, getting the role was only half the battle; actually playing Lauda, and embodying both his prodigious driving skills and his prickly demeanour, was another matter entirely, and Bruhl admits to being more than a bit nervous about the prospect. He also gives credit to screenwriter Peter Morgan, writer of The Last King Of Scotland and Tinker, Tailor, Soldier, Spy, with giving the actual events their just due. “I think Peter Morgan is one of the best screenwriters when it comes to stories based on real characters, because the journey of these two characters was already in the script and I like the fact that both of these guys are likable at the end – you would have empathy for both of them. It’s not a conventional film where you would have a hero and a villain. When we started shooting the film I was doubting if people would like me or my character at the end, but Peter Morgan always told me that people would understand his attitude and will also find him quite funny – and that’s true, actually.